Enlarge The PSC2 is a plate amp for use in powered speaker systems. As an active speaker controller, a PSC2 can form the basis of a powerful active two-way monitor. Figure 1 shows the audio path of the PSC2. 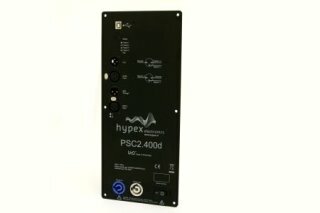 The module has two 400Watt UcD modules implemented and is also available with a digital audio input AES/EBU, called the PSC2.400d version. The supply voltage is provided by a Switched Mode Power Supply (SMPS400) module, also a module from Hypex Electronics. A PC controls the PSC2 through the USB port. This connection is used to upload the configuration and filter settings. It will also be possible to update the firmware through USB. Its Digital Signal Processor is fully configurable to suit applications as diverse as 2-way monitor speakers and powered subs. Four programmable presets, Powercon inlet and balanced audio inputs make it the ideal workhorse for professional or high-end domestic speakers. Output power: 400W @ 4Ohms per channel or total. And with 2 modules it is also possible to set up a 3-channel system with one module for the separate Subwoofer, and a second module for the top in a 2-channel system. Enlarge The PSC2 is a plate amp for use in powered speaker systems. As an active speaker controller, a PSC2 can form the basis of a powerful active two-way monitor. Figure 1 shows the audio path of the PSC2. 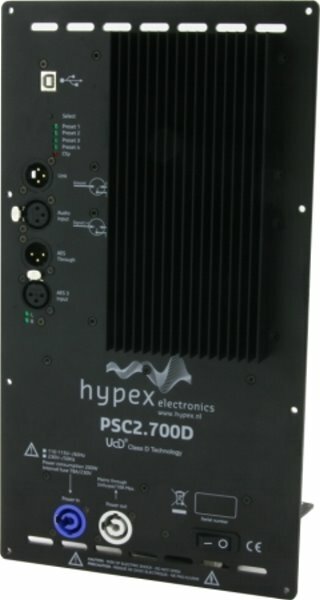 The module has two 700Watt UcD modules implemented and is also available with a digital audio input AES/EBU, called the PSC2.700d version. The supply voltage is provided by a Switched Mode Power Supply (SMPS1200) module, also a module from Hypex Electronics. A PC controls the PSC2 through the USB port. This connection is used to upload the configuration and filter settings. It will also be possible to update the firmware through USB. Enlarge The "AS2.100 is a plate amp for use in powered speaker systems. 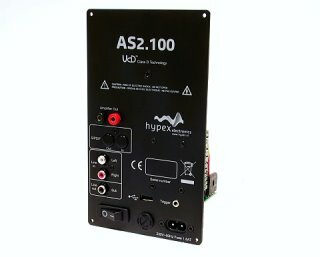 As an active speaker controller, a AS2.100 can form the basis of a powerful active two-way monitor. In stereo mode one AS2.100 will power an active master / passive slave pair. Finally, the module may also be used as a one-way 140W amplifier. All signal processing, including volume control, is done using the on-board DSP (digital signal processor).Figure 1 shows the block diagram of the amplifier. When two modules are used, the second unit slaves to the first unit (master) through a link cable. The link cable (a stereo mini jack cable) carries both the right audio channel and control data. This way, both units respond to the master s control panel. A PC controls the AS2.100 through the USB port. This connection is used to upload the configuration and filter settings. An optional board permits use of the USB link for audio as well as an SPDIF link. In digital mode, master/slave linking is done through the SPDIF in/out connections instead of the mini jack cable. All setups are possible with analogue and optional with the digital audio inputs SPDIF and USB. Enlarge The AS2.100 Digital is a AS2.100 including the optional digital add-on board. The "AS2.100 is a plate amp for use in powered speaker systems. As an active speaker controller, a AS2.100 can form the basis of a powerful active two-way monitor. In stereo mode one AS2.100 will power an active master / passive slave pair. Finally, the module may also be used as a one-way 140W amplifier. All signal processing, including volume control, is done using the on-board DSP (digital signal processor).Figure 1 shows the block diagram of the amplifier. When two modules are used, the second unit slaves to the first unit (master) through a link cable. The link cable (a stereo mini jack cable) carries both the right audio channel and control data. This way, both units respond to the master s control panel. A PC controls the AS2.100 through the USB port. This connection is used to upload the configuration and filter settings. An optional board permits use of the USB link for audio as well as an SPDIF link. In digital mode, master/slave linking is done through the SPDIF in/out connections instead of the mini jack cable. All setups are possible with analogue and the digital audio inputs SPDIF and USB.